This Sunday I’m leaving Taylor and Henry at the farm and heading up to Seattle for 2 days to do a few book events. I’m really excited for a dinner being hosted by the talented Jim Henkins at his shop Marine Area 7. Jim will be cooking a 5 course meal out of my cookbook for 25 folks and I’m thrilled to have a seat at his table and not do the cooking for once! Unfortunately, (or fortunately!) the event sold out in a few hours (pinch me!) so there are no open seats left. However, I’ll be doing a book signing and cooking demo at Book Larder on Monday evening (May, 1st) so all you Seattle folks should head on down at 6:30pm. I was originally scheduled to do a book signing this Saturday at Liberty Books in Paulsbo, WA but had to cancel last minute because this Saturday is one of our biggest planting days of the season and I can’t be away from the farm. My deepest apologies to folks who were planning on attending the event. I’m learning the hard way that overcommitting to events during farm season can be tricky. It really is hard to be away (especially in the Spring) and I hate leaving Taylor and Henry to pick up my slack. So to the folks that I let down this weekend I hope you understand why. And if you can make it up to Book Larder instead I would love to meet you! I’m still planning on doing a recap of my book events in a Farm Diaries post soon. However, I’ve decided to lump them together so I’ll wait to post until after I get back from Seattle. There’s been some pretty amazing things that have happened over the coarse of this past month and I can’t wait to share with you all. Stay tuned! Alright, enough book talk, let’s get to this awesome recipe. As much as I love a freshly baked muffin or granola to help fuel me up in the morning sometimes I crave lighter fare and this breakfast salad is perfect for a weekend brunch at the farm. We’re harvesting the first of our spring arugula and hot damn, it’s so delicious! Fresh, pungent and perfect eaten by the handful. This is one of those recipes that I’m going to give you all free reign to play with. We tossed our arugula in a simple dressing of olive oil and lemon juice (no need to overdress fresh arugula!) and topped our salads with soft boiled eggs, bacon, feta cheese and a little fresh dill for good measure. This is a lovely way to celebrate all the spring bounty and I hope you all enjoy it as much as we do. 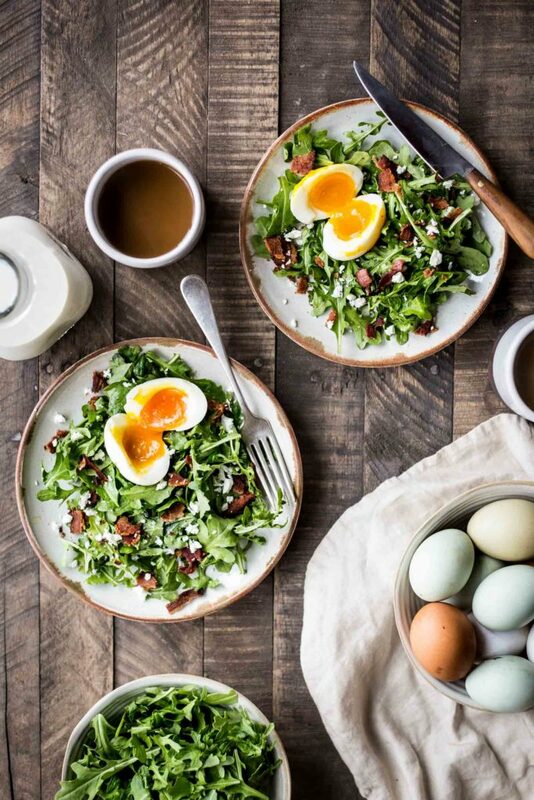 Anyhow, I hope wherever this weekend finds you that you are able to slow down a bit and enjoy this simple breakfast salad with someone you love. Pour a cup of coffee and dig in. Preheat the oven to 400F. Line a baking sheet with parchment paper. Lay your bacon out in a single layer over the sheet and place in the oven. Bake until fully cooked and crispy. About 15 minutes. No need to flip the bacon! Once cool enough to handle roughly chop the bacon. Heat a large pot of water and bring to a boil. Gently lower the eggs into the water and reduce the heat to a low simmer. Cook for 6-8 minutes--depending on preference of doneness. Remove from the water and place under cold water. Peel the eggs and set them aside. In a large bowl toss the arugula with the olive oil, lemon juice and some flakey sea salt. Dive the greens between plates and top each plate with a soft boiled egg, bacon, feta cheese and minced dill. Season with freshly ground black pepper and enjoy. Enjoy your articles but if we in Louisiana left the eggs on 8 min. they would be like rubber. So, we boil for 3 min. turn off fire and let pot sit for 5 minutes. God bless you and yours!